At a middle school set in a low-income neighborhood of Busan, South Korea, I witnessed the potential for blended learning to boost Korean students’ achievement, engagement, and happiness. I also saw blended learning’s power to boost the morale of the teachers and community. With the support of the school’s principal, the Busan Nambu district superintendent, and outside mentor teachers, three teachers at Dongpyeong Middle School took the bold step in Korea of flipping some of their classrooms in a controlled experiment that was recorded—and supported—by a KBS film crew in a terrific documentary that aired last week. The results after one semester appear to be stunning, according to Min-Kyung Lee, a professor at Daegu University, who helped set up the experiment and study its results. In the Korean classes taught by a teacher who flipped all of her classes, the students’ achievement skyrocketed by 20 to 50 points on a 100-point scale compared to their achievement the previous semester. In English and math classes, where a teacher in each subject flipped only some of her classes to establish a control trial, student achievement was 5 to 20 points higher on the tests, Lee said. The group engaged in studying, supporting, and flipping the classrooms hypothesizes that the bigger gains occurred in the Korean classes for two reasons. First, the students in the English and math classes are sorted by ability level, which means the material is already pitched at a closer level to students’ abilities so that the potential gains may be less. Second, few if any students attend hagwons for Korean, so they may have more untapped potential or room for improvement that the flipped design cultivates more effectively. Seeing the results, the group believes that the flipped classroom ends the need for leveled, or tracked, classes in English and math—a controversial practice in Korea despite the fact that perhaps as high as 90 percent of schools do it. Also eye popping was that students stopped sleeping in class, a persistent problem beforehand. When I was there, the students barely noticed a visitor in their midst and kept working diligently in their small groups, as they actively discussed the problems in front of them and worked through the answers. The teacher did not lecture. In the first class I saw, she was barely visible. Instead of standing at the front, she walked around helping individual students and groups. According to the school principal, Chang Joon Yoo, bullying is also down. And one student told KBS that there is no reason to attend hagwons anymore. With the full disclosure that having seen this breakthrough, I am now an adviser to a group that the KBS documentary director, Chanpil Jung, has formed to amplify the rethinking of schools across Korea, I did see lots of room for further innovation and improvement. But given how Korean schools operate and how many Koreans think teaching and learning should look—stand and deliver a lecture to an entire class that receives passively the information—each of the above results represents a significant shift in the Korean mindset and a big leap forward. Together they are revolutionary. In the classes, teachers create the online lesson videos, which were of better quality than I expected. The students watch them before class, generally at home on YouTube. In class, the students are divided into groups of 4 or 5 of mixed ability. The students tackle projects or problems in class with the teacher there to guide and facilitate, and the advanced students help teach those students who are struggling, which deepens their own understanding. Friendly competition often breaks out between the groups. 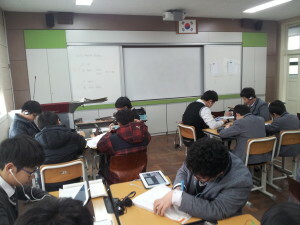 There were roughly 30 students in the math and English class I observed and 40 students in the Korean class. At the present time, the students do not appear to do work that is personalized to their needs in the class, nor are the classes competency-based. The students typically do the same assignment on the same day. The individualization comes from the ability to control the time, place and pace—including the ability to pause, rewind, fast forward, or review an earlier concept—of their learning online, the freedom for the teacher to rove around and work with individuals or small groups, and the ability for each student to play a different role within the group. Additionally, to this point the teachers are creating all of the core online lessons. The reason, they said, was that students prefer to see their own teachers on screen because it feels like their friend is talking to them. But they haven’t tried any other way. The notion of using third-party software, let alone adaptive learning or game-based learning software, was foreign to them—as it is to almost all of the Korean educators with whom I have spoken. Although schools will pay for hardware, paying for educational software no matter the quality is not done typically. That said, the students do use various educational apps in classroom activities on the 180 “smart devices”—iPads and Galaxy tablets—that the school owns. The teachers want to try out new pedagogical approaches in their online videos to make them more engaging. They also seemed amenable to the idea of their fellow subject-matter teachers creating videos and then allowing their students to choose which video they wanted to watch to learn a particular lesson. They grasped how this could allow students to tailor their learning more to their individual preferences, as well as the opportunity this presented to lessen the burden on teachers for having to create every online lesson from scratch over time. Unsurprisingly, adopting the flipped classroom was greeted with lots of skepticism initially. Although there was a hunger from teachers to overcome students’ boredom and sleeping, adopting the flipped methodology was a lot of work up front. They had never created videos before, so the early ones took a long time to make. The shift in their classroom teaching practices away from lecturing to designing and facilitating a variety of activities, including discussions and projects, was a significant shift. And the Korean students had little to no experience with this type of methodology that would require them to be active learners. The principal of Dongpyeong Middle School played a key role. Doing something new was essential, Yoo said. He told his staff that they shouldn’t give up before trying. Jung was then crucial to persuading the teachers. Although the first class was tough—many of the students had not watched the videos at home—the adjustment did not take long. Within two weeks, the teachers told me, everyone had adjusted. It became easier to create videos, students watched them beforehand, and discussions began flowing. The teachers and students felt much happier. Although Korean teachers hold a place of respect in society, because students do much of their learning in hagwons—and often their sleeping in schools—they have been losing that feeling of being respected. This restored that respect, and the teachers feel rewarded for a job well done. The teachers did say that they would like coworkers to help them in creating engaging classroom activities, which is now the real hard work. They believe that creating videos will be easier for teachers in the future given what they have learned and as teachers can use others’ videos potentially. The question then is how to scale this beyond these teachers in this one school. As the superintendent, Sook-Kyung kim, said, “smart learning”—a Korean phrase for using mobile devices to learn—is already part of students’ lives. The question is how to implement this into schools. In a discussion with Jung, professors from Korea University, and others, I learned that people felt a low-income middle school was the ideal place to adopt flipped learning first. Although elementary school is perhaps the most flexible in Korea and already has more interactive classes, because the teacher teaches every subject, creating the videos for a flipped classroom feels like a lot of work. In high school, the stakes are too high for innovation because of the looming College Scholastic Aptitude Test. While some applauded the improved grades, they said that real change cannot occur while that test remains in place; ultimately even post-university students are not very employable because they are so driven by rote memory for narrow tests, but parents won’t risk adopting an unproven innovation if it might sacrifice their child’s opportunity to attend a top college. As a result, middle school represents a safe haven for innovation and is the best place to start. Starting with a low-income school was also important so that people would believe that if it could happen here, it could happen anywhere. Indeed, at some other schools I visited in Gyeonggi Province, outside of Seoul, where the former superintendent has made a big splash propelling over 300 schools to become innovative ones with far more student choice in school and small-group discussions in class, what I learned is that it is far easier to make these sorts of changes in the middle schools. Although principals and teachers had made changes in high schools, they were more constrained. And schools that were initially undesirable are now driving real estate prices around them upward since the changes. Too many parents though still believe that an interactive classroom isn’t a real classroom. Learning is “supposed” to be from teacher to student. Parents see new practices, like the flipped classroom, as time consuming and ineffective. Teachers should cram all the knowledge into students’ heads in a short period of time. In my observation, what people are doing is mistaking hearing for learning. Real results should help, as should the documentary. The fact that Dongpyeong Middle School, like the schools in Gyeonggi, have been transformed from being a sore point in the community to a point of pride could also help. While for too long Korea has focused only on student achievement and not the happiness of its students, it must not now make the mistake of focusing only on whether students are happy regardless of whether they learn. Striking a balance of fostering achievement, happiness, and creativity is key. The flipped classrooms in Busan are a big step in that direction. As Lee said, what education technology can do is humanize the class, as it increases the relationship between the teacher to students and students to students. And that’s a beautiful thing.